Another great day to be out on two wheels, or in this case three wheels. Took my sons over to the North County Trail Way just outside of Yorktown Heights to go riding with my father. We tried riding here a couple of years ago with my daughter but ran into problems with her stamina and ended up not riding very far. Too bad I never tried the Trail-a-Bike Train until the following year. with our new, Tandem Trail-a-bike, I can expand our range and ride longer and further like on Sunday. 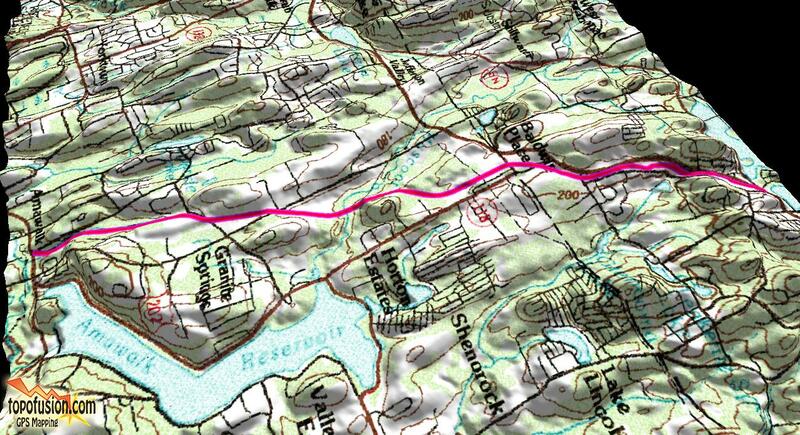 We ended up riding from Rt 35 in Amawalk to Mahopac, 6.5 miles in one direction. With the exception near the Amawalk Reservoir the ride is a steady climb up hill but you barely feel it except in one or two places. The North County Trail Way ends in Bladwin Place, which neighbors Mahopac. Nice place to take a break and carb up to tackle the climb up to Mahopac. After taking our little break, dropping a few crackers on the ground, and a photo opportunity, we were off to Mahopac largely because my father has never been past this point. Katie and I tandemed down to this point over the summer. At Mahopac Station, we checked out the lake and climbed the fence. There is a nice cafe in the old station but not a place where my two sons would be happy. 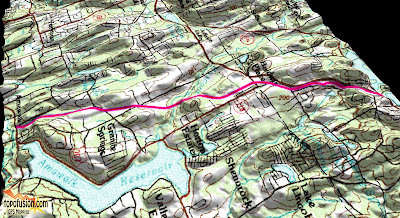 This is the kind of profile I look for on a rail trail, nice and smooth but for some reason the GPS always starts out a little higher and ends a little lower. It's Friendly's or nothing, and that is the beauty of Yorktown Heights, just a few miles down the road from where we parked, they have a Friendly's and a really nice park for the kids to play at, because that is important, too. In some respects, the boys are just along for the ride, their reward is the Park, but deep down they like being out with their father. Service at the Yorktown Heights Friendly's was painfully slow and it put at the park at 4 PM. Then we needed a break so Brodie could use the facilities at the local KMart. Then it was back to park till it got dark. Next week, we are off to do the Monroe Rail Trail and go to Wolfe Park.